[Baltimore, MD] February 11, 2019 – A Baltimore-area man recently became a bone marrow donor after registering at a There Goes My Hero event five years ago. In 2014, Burton Daniel swabbed his cheek at a food truck rally hosted by The Gathering. He received a phone call that he was the match for a patient in need of a bone marrow transplant. This year, he donated his bone marrow to a stranger, in hopes of saving their life. In 2014, There Goes My Hero was invited to host a bone marrow registry drive at The Gathering food truck rally at McHenry Row in Baltimore, Maryland. That same year, Mix 106.5 DJ Maria Denis was diagnosed with leukemia. As part of her blood cancer awareness campaign, the radio station hosted a number of bone marrow registry drives. 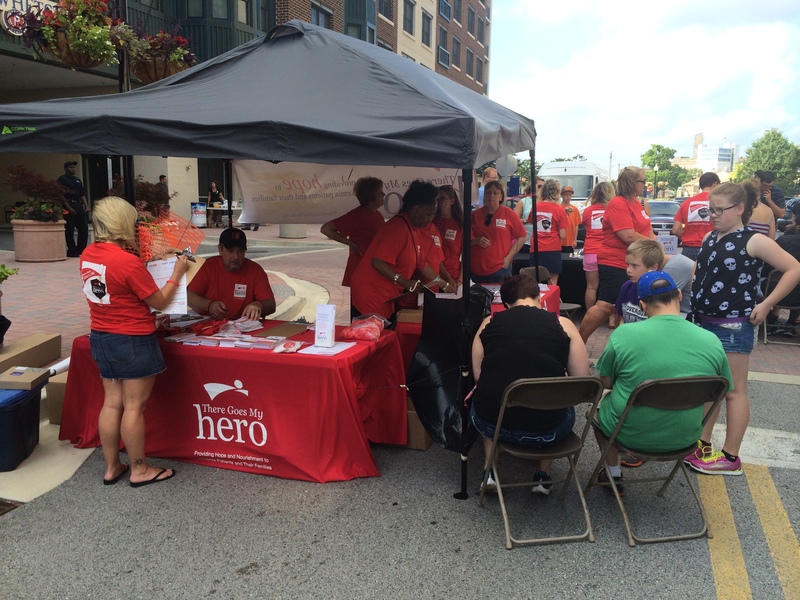 They facilitated the event at McHenry row, where There Goes My Hero registered 126 donors. One of those registrants was Burton Daniel, a financial advisor in Baltimore. He didn’t think much of it: “I casually took a cheek swab to add my name to the registry…. And moved on with my life.” When he received the notice from There Goes My Hero’s partner DKMS, his heart started racing. He knew this was a chance to “to be truly selfless,” and do good for someone else. But he doesn’t think of himself as a hero, he just did what he thought was right. In recovering from the donation, “I am reminded what my recipient must be going through right now and realize this is nothing,” he says. Like many donors, he says he would do it again in a heartbeat. Every year, tens of thousands of people need a bone marrow transplant. For many patients suffering from blood cancers and blood disorders, this treatment is their only hope for a cure. While some patients can find a matching donor within their family, 70% have to rely on a stranger. Registered donors have a 1 in 430 chance of going on to donate. However, many patients cannot find the life-saving donor they need. Only 2% of the population is on the registry, and People of Color are underrepresented, meaning patients of African, Latino, and Asian descent have a harder time of finding a matching donor. There Goes My Hero was founded by Erik Sauer in 2009 to provide hope to leukemia patients. After a leukemia diagnosis and bone marrow transplant from a stranger, Erik wanted to make sure that other patients felt the same hope he felt. In the last ten years, There Goes My Hero has added over 20,000 donors to the registry, which has resulted in 27 life-saving donations to patients in need. About There Goes My Hero: There Goes My Hero is a registered 501(c)(3) non-profit charity located in the Baltimore area. Our mission is to restore hope to blood cancer patients and their families by increasing bone marrow donors, funding nutritious meals, and supporting blood cancer patients. To schedule a bone marrow drive at your workplace, church or synagogue, please contact TGMH at 443-266-8881 or visit theregoesmyhero.org. About DKMS: DKMS is an international nonprofit organization, founded 27 years ago in Germany by Dr. Peter Harf when he lost his wife Mechtild to leukemia. Peter promised her that he would help every blood cancer patient find a matching donor. At that time, there were only 3,000 potential stem cell donors available to provide a transplant in Germany and within one year of founding DKMS, the number of stem cell donors increased to 68,000. Today, DKMS has offices in Germany, the United States (opened 2004), Poland (2009), and the UK (2013) and has registered over 8 million potential donors worldwide. DKMS has over 600 staff members from 20 countries dedicated to helping give every blood cancer patient a second chance at life. DKMS is driven by innovation and invests in our people’s ideas in order to be the premier provider of assistance to blood cancer patients throughout the world. DKMS is dedicated to the fight against blood cancer and blood disorders by: creating awareness; recruiting bone marrow donor to provide a second chance at life; raising funds to match donor registration costs; supporting the improvement of therapies through research; and supporting patients from day one of their diagnoses.